A customer journey is the total sum of experiences a customer has when interacting with a business or organization. Rather than focusing on a specific interaction, the customer journey takes all points of contact into account. When Does the Customer Journey Begin and End? It’s the journey that counts, not the destination. You’ve probably heard this statement before—it's something of a cliché about life. But could it apply to your business? To understand the customer journey, you must look at the experience from your customer’s perspective. 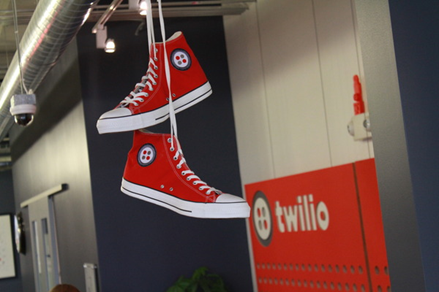 At Twilio, we take the value of “wearing the customer’s shoes” so seriously that we have shoes literally hanging on the wall in our headquarters to remind us. When you take a walk in your customers’ shoes, can you pinpoint when they “arrive” at their final destination? You’d probably like your customers’ journey with your business to be long and fruitful (perhaps with no end in sight!). So, when exactly does the customer journey with your company begin? Is it when customers purchase their first product, or when they make contact through one of your communication channels? It’s actually before that, when a customer hears about your business or organization for the first time. The customer journey starts with awareness. Perhaps it begins when a customer sees one of your ads or hears about your business from a friend. That’s why your marketing team is hard at work making sure people hear about you. The next step in the customer journey is engagement. This is when a customer interacts with your company in some way; perhaps they visit your website, download your app, or walk into your brick-and-mortar location. There may be many points of engagement along the customer journey, and hopefully, they will all be positive. Engagement revolves around developing an ongoing and loyal relationship with your customers which leads to increased retention, revenue, and reach. At some point, the customer will buy your product or service—but the journey doesn’t end when the sales transaction is over. If their experience is great at every step along the way, your customers will become advocates for your product or service and keep coming back for more. At this stage, the cycle continues at awareness once again, only now, your customers are the ones making sure people hear about you. The contact center is the central means of communication for many businesses and their customers. Traditional, phone-based call centers have evolved into multichannel contact centers designed to deliver a great customer experience—an experience that matters greatly to a business’s bottom line. Consumer research shows that 67% of customers will give more business to a company as a result of positive communication experiences. On the flip side, Twilio’s recent Customer Communications Report found that after a poor communication experience, 38% of customers will switch to a competitor or cancel orders or services, 66% will tell a friend about their experience, and 41% will stop doing business with the company altogether. Today, contact center agents interact with customers through a variety of channels. Within the span of a few minutes, an agent could be on a live chat assisting a customer who is browsing your website, sending an SMS that lets a customer know her order has been shipped, or answering a technical question delivered via Facebook Messenger. These modern contact centers are built with APIs, software building blocks that let you create the exact experiences you want. First, your contact center must offer the customizability to flex and change as often as you like. Great customer experiences aren’t built only once. With a customizable contact center, you can use insights from your customer data to continually improve the journey. Next, you must be accessible to your customers on all the channels they use, with integrated context for a seamless experience. An omnichannel system lets your customers move between channels—such as switching from a live web chat to a voice call—while keeping track of context for a seamless and personalized experience throughout the customer journey. Third, look for the latest in AI technology and natural language understanding so you can communicate intelligently with your customers and provide faster resolutions. With contextual intelligence, it’s easy to capture and leverage customer information and route it to agents to deliver a personalized “wow” experience. AI can also free up your agents to focus on high-value issues that require a human touch. The fourth key ingredient to a great customer journey is one that may not be as evident, because it underpins all the other technology in your contact center: the trust and scale of a reliable cloud communications platform. With your communications based in the cloud on a secure platform, you’ll be able to focus on building unique communication experiences with your customers instead of dealing with the messiness of traditional telecommunication. Every business is different, and so are their customers’ needs. Likewise, there is no “one size fits all” when it comes to the customer journey. To create an ongoing superior customer journey, you need to develop the perfect recipe for your contact center. As long as your recipe includes these four key ingredients, you’ll be well on your way to five-star reviews. Your customer journey encompasses more than your products and services. The experience you create for your customers at every touchpoint contributes to the overall journey they have with your business. The key to creating the customer journey you want is having the right technology in place to support your customers at every point of contact. In the rising on-demand economy, customer preference is changing at an accelerated rate. Businesses who are successful in meeting this change aren’t only putting communications at the heart of their interactions with the customer but also understand the need to empower their developers to build and iterate these communications quickly and creatively. APIs make it possible to build communications that connect with customers on the right channel at the right time. With APIs, today’s businesses can quickly and easily develop applications that fit their global business needs, and deliver rich, contextual communications that take the customer experience to the next level. This is how both brick-and-mortar and online brands can create journeys that nurture lifelong customers, all while evolving with consumer communication trends and expectations.